I managed to run Brazen Racing’s Summer Breeze 10K this year again, and the race is bigger and just as well organized as ever. Having attended a few races, I am growing in appreciation for a well-organized race. San Leandro is one of the coolest courses in the Bay Area for beginners because it is mostly flat, and it is a beautiful place to run. You are right by the ocean and the view is quite breathtaking. My son really enjoyed all the airplanes that flew by to land at Oakland airport and SFO. 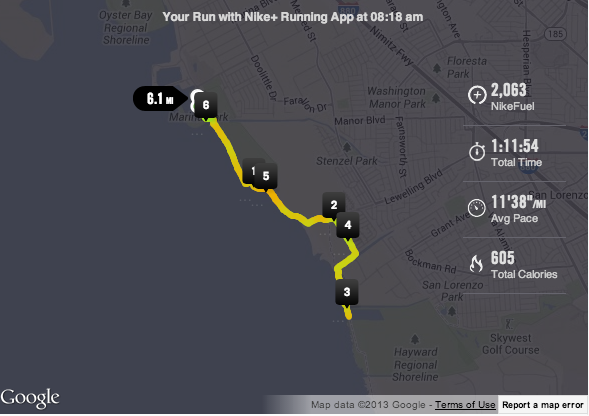 The weather was perfectly overcast but not too cold for the run. I managed to complete my 10K not in stellar time, but 1:11:27 (chip time) and 11:32 pace is not too shabby considering I was pushing about 69lbs (26lbs stroller + 35lbs kid + 8lbs goodies). Roger also got out and managed to run a little over half a mile this time, but he wasn’t quite as inspired this time as previous, so he actually stayed in the stroller for the most part. 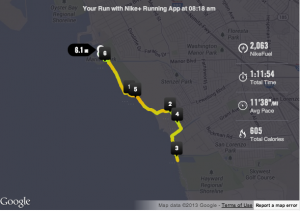 I am happy to say that at this point on the run, he runs still a little slower than I run. Thank goodness. I barely made the run on time. 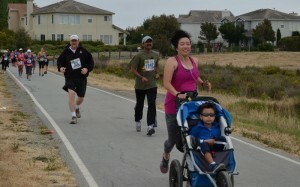 In fact, my son was yelling at me that the race started when I was trying to put my bib on! I had to catch up with the end of the 10K start and ended up stuck behind many slow and leisurely walkers. I wish sometimes I didn’t have to try to get around all the walkers with my stroller but as a stroller mama, that is what you are supposed to do anyway. I actually started my Nike Run app late (but I also ended it late after I crossed the finish line) so please bear that in mind when you look at the graphic below. 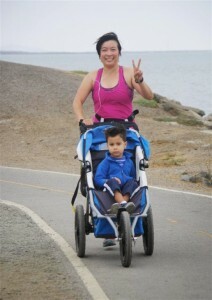 For most of my run I pretty much felt like a rickshaw driver pushing my little gentleman along, who was looking too cool for school. I am pretty excited to book my next race though, and I haven’t decided what to do yet.